Cappuccino vs Latte vs Macchiato | What's The Difference? Cappuccino vs Latte vs Macchiato vs Mocha: What’s The Difference? Unless you’re a coffee aficionado or a skilled barista, it’s probably a challenge to know the difference between coffee drinks on a cafe menu by name alone. 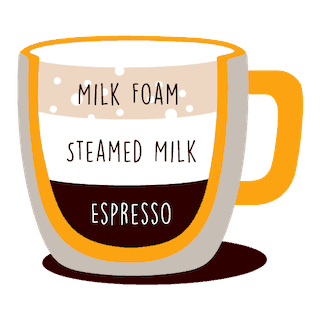 Cappuccino doesn’t sound too far off from a macchiato, but while the names may seem to be based on trend only, there’s actually quite a bit of history behind coffee house drinks. Some of them even look very similar, but one taste, and you’ll know that a cappuccino is definitely different from a flat white or a macchiato.